I rebooted my computer this morning and Adobe offered a new version of their Flash Player. 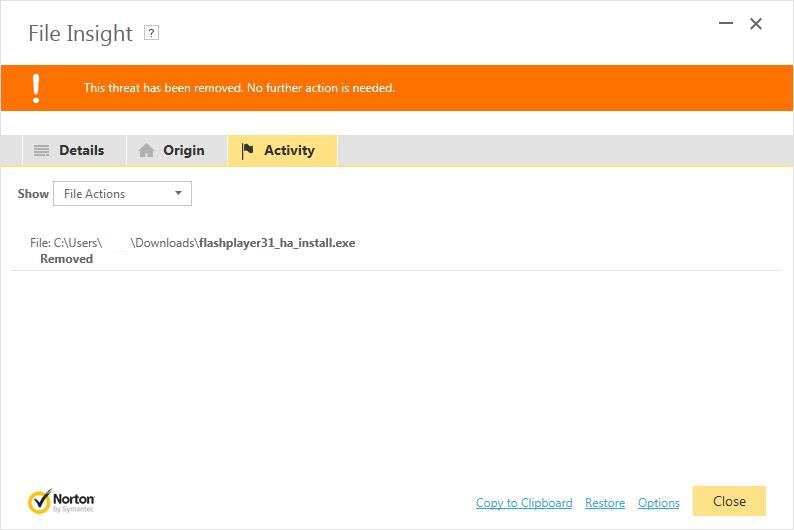 Note that the Flash Player download took place as a result of Adobe's own schedule task, and came from Adobe's own website. Other than disabling Norton for a few minutes to carry out this download and installation, what else can I do to prevent N360 from getting in the way? Unless the Adobe servers have been hacked, this really should be a no-brainer. When you downloaded the installer, were you taken to the Adobe site, or did the download just start? If you were taken to the Adobe site, did you make sure you unchecked any option to allow another product to be downloaded alongside the Adobe update? That could be what triggered the warning. Yes, I was taken to the Adobe site, and I did uncheck the McAfee offer. The file info in one of the screenshots says that the file is less than a week old. I'm wondering if Norton viewed it as suspicious because it's so new. 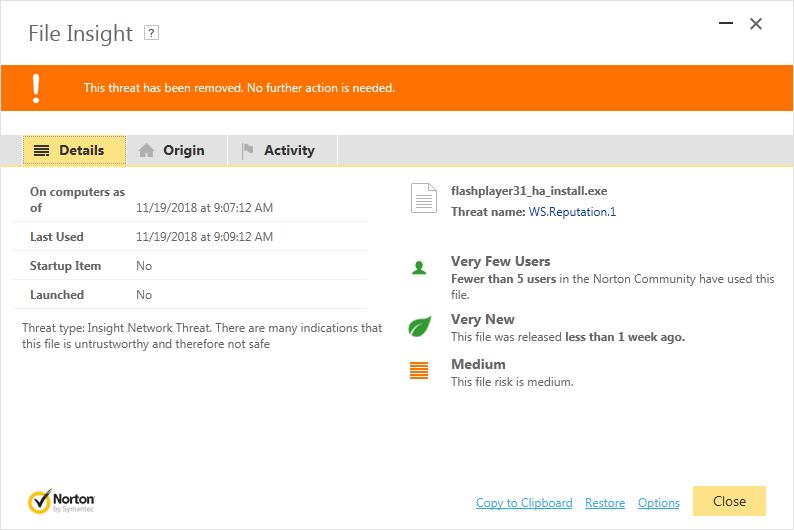 Files reported as WS.Reputation.1 may not necessarily be malicious, and may be a false positive detection. Should you be uncertain whether a file has been reported correctly, you may submit file to https://www.virustotal.com (link is external) for second opinion scan with multiple antivirus engines. All right, following the instructions from the FP submission link, I downloaded the latest virus defs and, after returning to Adobe's site, managed to install the newest Flash Player version this time. Yes, sometimes waiting (a few days) clears WS.Reputation.1 detection. Submitting a dispute at https://submit.symantec.com/false_positive/ helps.